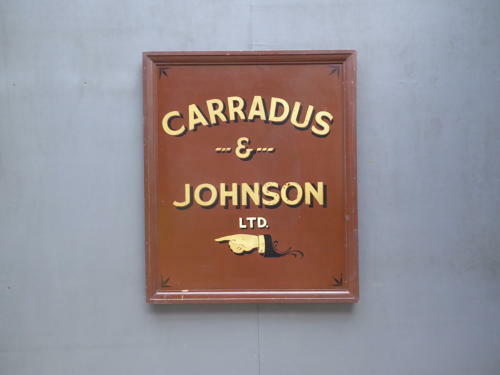 A beautiful large original hand painted wooden trade sign for Carradus & Johnson Ltd. A charming hand painted & framed wooden advertising sign featuring some beautiful workmanship & traditional sign writing with shadowed lettering & pointing hand detailing. The sign is in hardboard & the frame in pine & both have a pleasing age related patina. A fantastic original piece of advertising. Wear commensurate with age, very good unrestored condition. Displays beautifully.